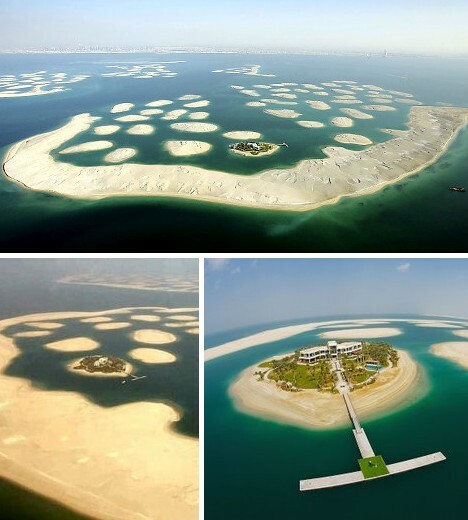 Following on the successful completion of other offshore artificial island communities like the Palm Islands, Dubai’s World Islands was intended to be even more ambitious, not to mention larger. 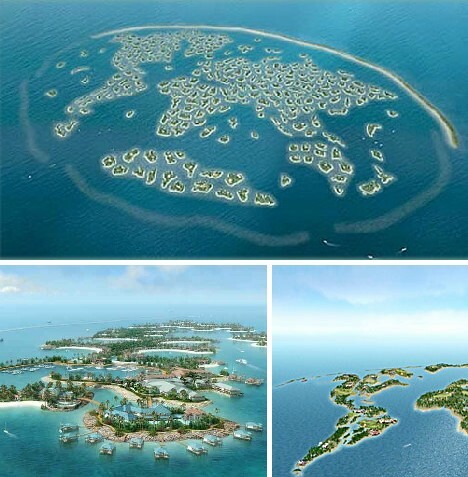 Imagine owning a private island in the shape of a country or continent, surrounded by the warm waters of the Persian Gulf – and your equally “worldly” neighbors? While Dubai’s vision of a 300-island floating world may someday come to fruition, things aren’t so rosy at the moment thanks to the ongoing world economic crisis. 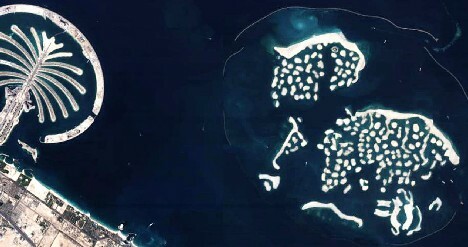 As of late summer 2009 only a single island has been developed and it belongs to Dubai’s ruling Sheik; “the rest looks like a pile of muck” according to a local realtor. With property prices crashing by 50 to 75 percent, many of Dubai’s spectacular construction projects have been put on indefinite hold if not canceled outright. 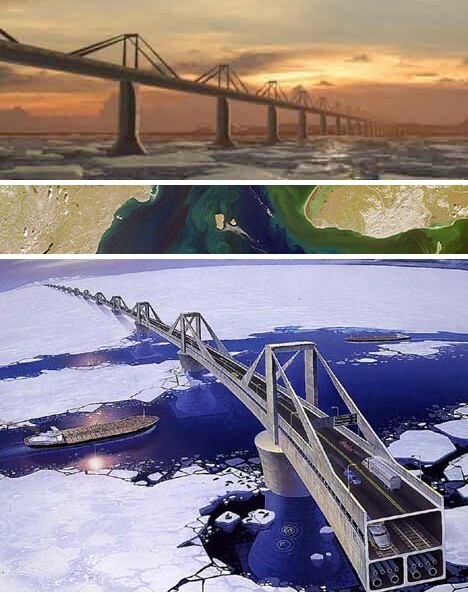 A bridge across the Bering Strait connecting Russia and Alaska? No, this is not a repeat from 11,000BC. 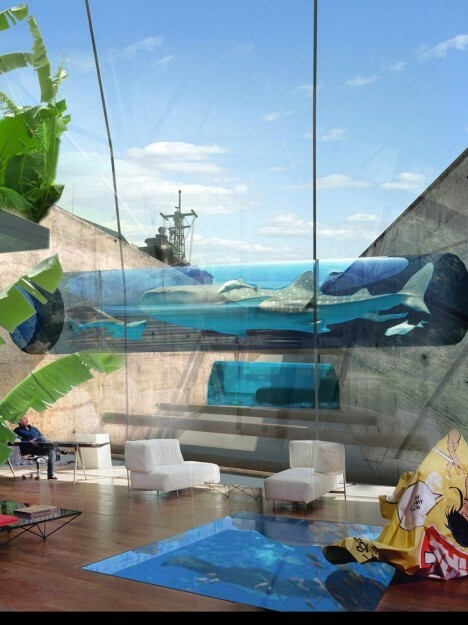 OFF Architecture won the 2nd Prize in the Professional Category at the 2009 Bering Strait Project competition (yes, there is such a thing) with their grandiose and green bridge-tunnel combo. The design would greatly reduce circulation between the Arctic and North Pacific Oceans, thus cooling the former and mitigating the effects of global warming. Or so they say. 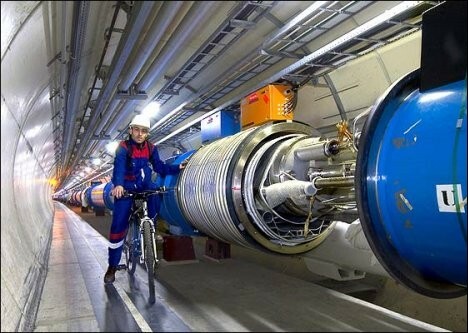 The Large Hadron Collider, or LHC being built by CERN is without question the largest and most complex machine ever constructed by Man. It has to be – the universe doesn’t give up its deepest secrets very easily. 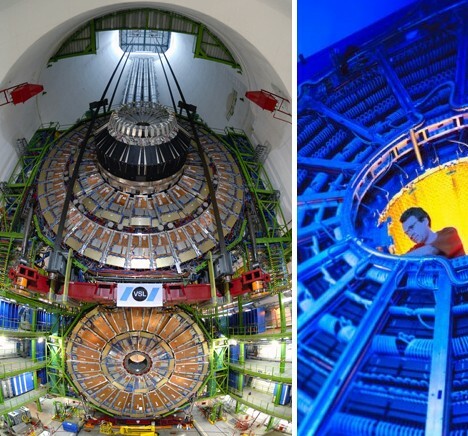 The LHC is the world’s largest refrigerator, requiring 10,080 tons of liquid nitrogen and nearly 60 tons of liquid helium to bring the temperature of the collider’s huge electromagnets down to -271.3°C (1.9 Kelvin). Want more? 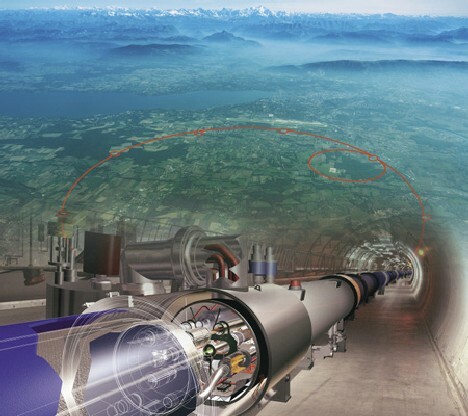 The interior of the LHC’s ring tunnel is the emptiest place in the entire solar system – the machine’s particle beams will travel through an ultra-high vacuum with ten times less pressure than you’ll find on the Moon. 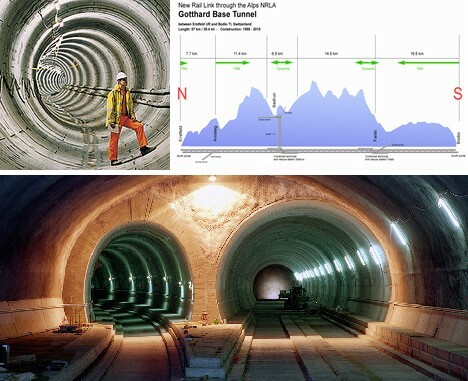 The 95.3-mile (153.5 km) long Gotthard Base Tunnel network now being drilled out beneath the Alps, when finally completed in about ten years, will be the longest underground tunnel ever constructed. High-speed trains traveling at 155 mph (250 kph) will significantly reduce travel times between Zurich, Switzerland and Milan, Italy while at the same time relieving the bottleneck of commercial and passenger traffic now clogging existing mountain highways and train lines. Hannibal would most definitely approve. The most difficult portion of the tunnel is the 57 km (35.4 mi) stretch that will run nearly 2,000 feet (600 meters) under the Gotthard massif below the existing Gotthardbahn track. It’s estimated that 459 million cubic feet (13 million cubic meters) of crumbly, porous rock will have to be removed during the course of tunnel construction – that’s enough to fill the Great Pyramid of Giza five times over. 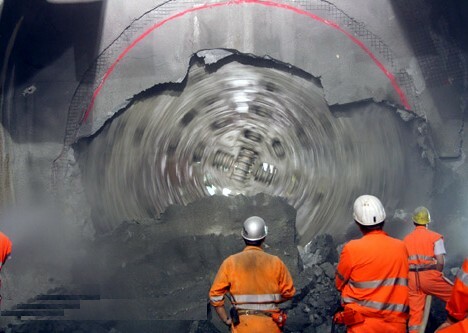 In the above image, one of the huge tunnel-boring machines is shown just as it breaks through to one of the completed sections of the tunnel. Though the shovels have yet to shift any dirt, the blueprints are ready for construction to begin on one of Asia’s most momentous megaprojects: the Japan-Korea Friendship Tunnel. 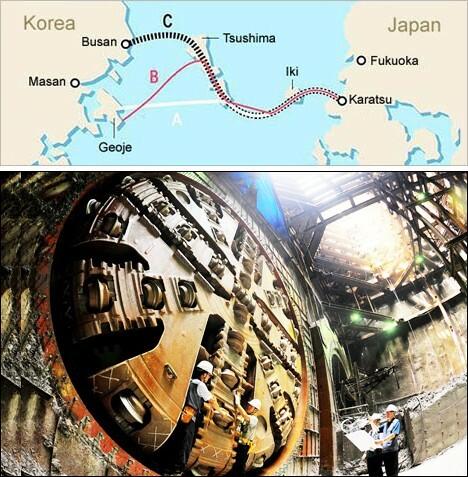 Or the Korea-Japan Friendship Tunnel – the fine details are still being discussed. Should the project get the nod from the politicos, work will begin on joining the southwestern Japanese city of Karatsu with the South Korean port of Busan with a 79-mile (128-km) train tunnel. The distance is more than three times that of the Anglo-French “Chunnel” but the technology is proven. As for North Korea’s take on the project, either Kim Jong Il hasn’t been told or everyone’s scared to bring up the subject. 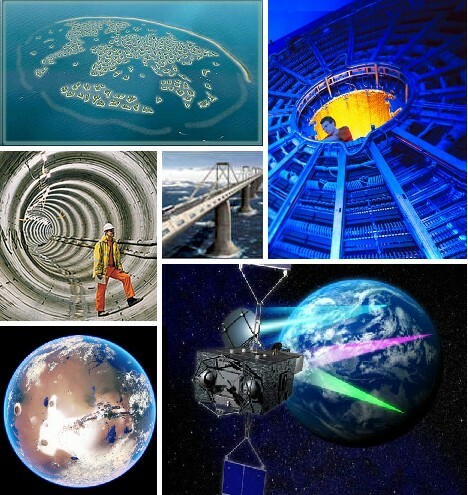 The challenges and difficulties involved in large-scale orbital construction projects are immense… yet someday they will be tackled as the demand for interplanetary spacecraft, space elevators and orbiting power stations becomes irresistible. 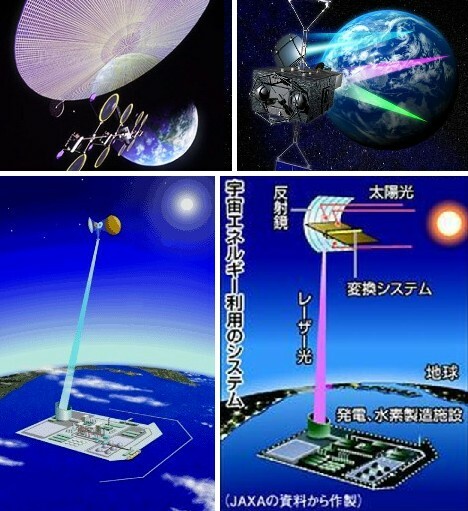 The latter – a solar power station in geostationary orbit – is now on the drawing board and has been given a sky-high price tag of 2 trillion yen ($21 billion). 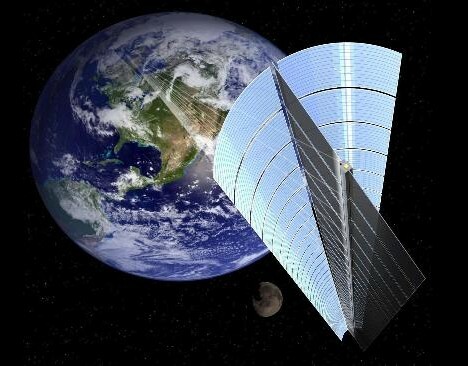 The project, conceived by the Japanese government and industry researchers, will see a space-based solar power station built in orbit 22,360 miles (36,000 km) above the earth. The station will generate 1 gigawatt of power from sunlight and beam the energy down to a receiving station where it can be used to power almost 300,000 homes. The most extreme engineering project in the history of the world will be performed OFF the world… on Mars. 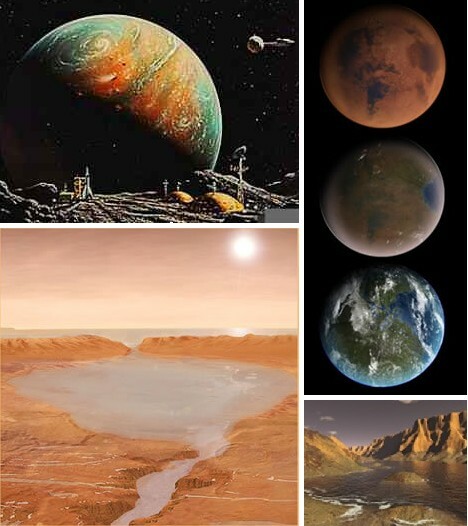 A variety of schemes have been floated over the past few decades with the intent of making Earth’s nearest neighbor more amenable to life of the earthly variety – in other words, Terraforming. Naturally the scale is huge – comets may be redirected to impact the Red Planet to provide water for oceans, which would be seeded with algae in order to boost the oxygen content in the Martian atmosphere. 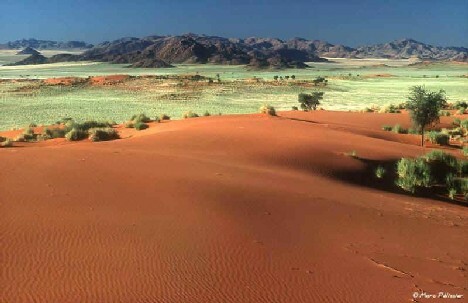 Other schemes entail the placement of giant orbiting mirrors to focus sunlight upon Mars’ polar icecaps, thus releasing liquid water and gaseous carbon dioxide to kick-start a greenhouse effect. 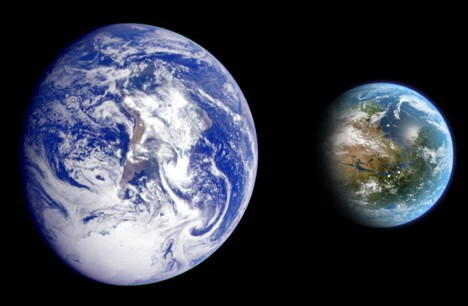 Terraforming Mars is no pie-in-the-sky scheme; it could be the salvation of our species should our actions on Earth continue to reduce our home planet’s livability. It would be most fitting if someday, as predicted/depicted in The Million-Year Picnic, a short story from Ray Bradbury’s book The Martian Chronicles, this scene should take place: A father answers his children’s desire to see Martians by suggesting they look into the canal their boat is floating on… in which they view their own reflections.